Our product range includes a wide range of heavy duty weldable toggle clamp for high production. We are amongst the leading names in the industry, offering an exceptional array of Heavy Duty Weldable Toggle Clamp for High Production. Our entire product range is functionally advance in nature and has high strength. Moreover, we offer them as per the exact preferences of clients. 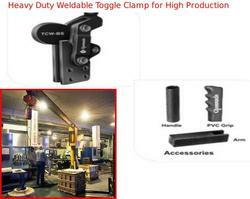 Looking for Heavy Duty Weldable Toggle Clamp for High Production ?